Google Content Experiments replaces Google Website Optimizer as the tool which website owners can use for the split testing of their site’s pages. Content Experiments is a tool which can be found in your Google Analytics account from which you can do your split testing with. 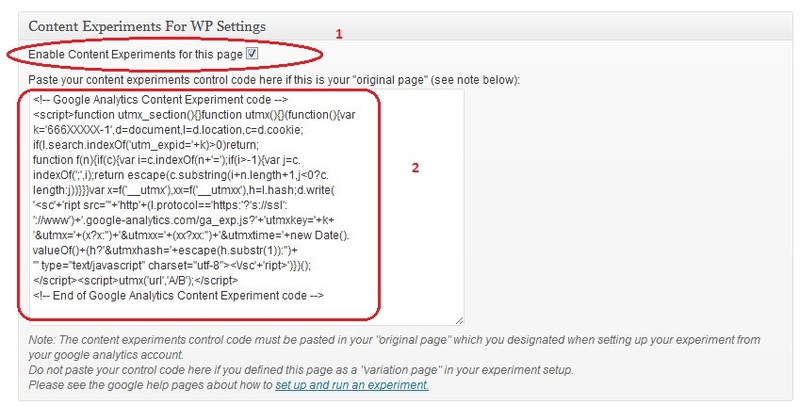 The WP Content Experiments & Event Tracking plugin gives you the ability to carry out Google split testing on your WordPress site by providing an easy interface which you can use to paste the relevant google experiments control code into the header of the page/post of your choice. In addition, if you want to perform event tracking on buttons, links or other elements so you can analyse the data in your google analytics account, this plugin allows you to easily add the event tracking code to particular elements from your wordpress post/page editor window. In order to run content experiments or event tracking, you will need a Google Analytics account and have your tracking code inserted into your blog. 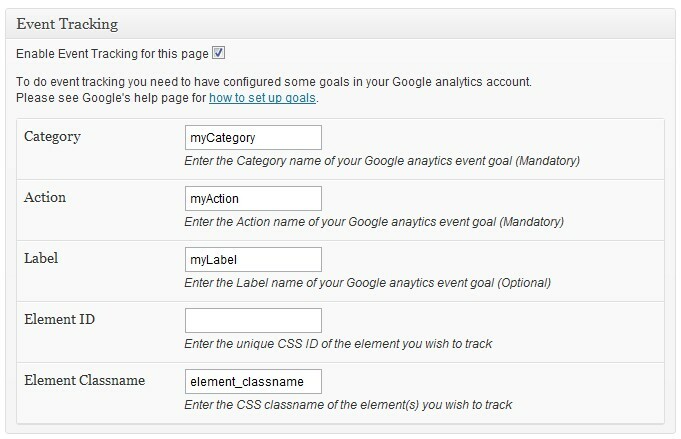 To learn more about how to use Google Analytics, there is a great blog post from my friends at firstsiteguide.com who explain how to use Google Analytics for WordPress. Therefore this plugin requires that you have the Google Analytics For WordPress plugin installed and configured. 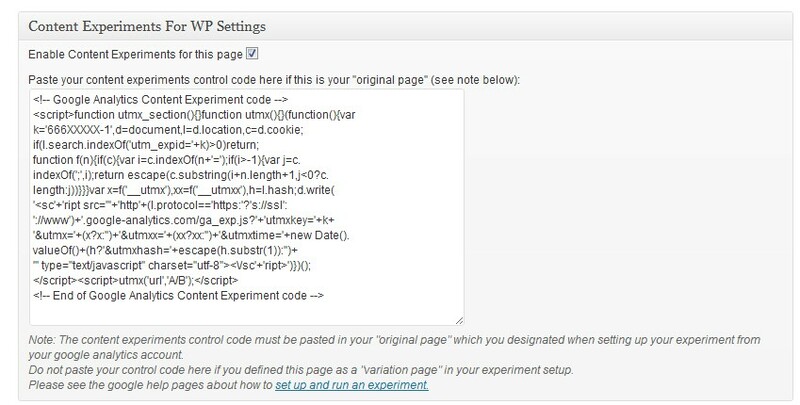 Activate the wp-content-experiments plugin through the ‘Plugins’ menu in the WordPress administration panel. Step 1: Using the WP editor open the page or post you wish to treat as the “Original” page for the content experiment you want to perform. Step 4: Save your settings by saving or updating the post or page, ie, click “Update” button. You can check whether your code was added correctly within the page’s <head></head> tags by viewing the source of the web page. 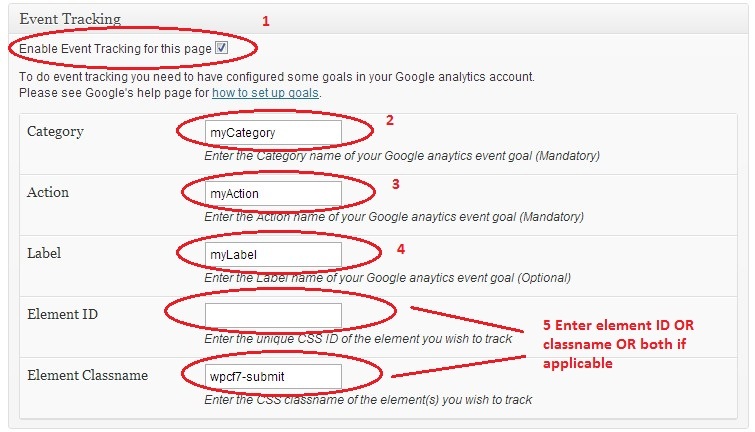 Pre-requisite: To perform event tracking you will need to set up a goal in your Google Analytics account. Step 2: Get the CSS class name or ID of the element which you want to do event tracking on. 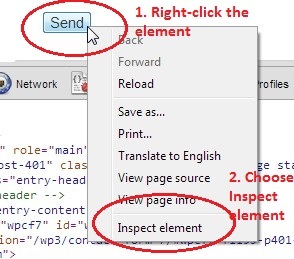 For our example it is the “Send” button shown in the figure above. You can then obtain the CSS class name or ID name (depending on your situation) as shown below. You will need this name for the next step. Step 3: Using the WP editor open the page or post you wish to perform event tracking on, ie, in our case it will be the page containing the form in the figures above. Step 7: Save your settings by saving or updating the post or page, ie, click “Update” button. I have installed the plugin. My objective is to trace everytime a person clicks in a button. In this page (http://www.digitaldiscovery.com.pt/contacto/) I have a buttom in the end of the form that says “Enviar”wich means “Send”. Now I have folow all the instructions here to trace everytime someone clicks in that button. I have created a goal with event in GA. I have Universal GA and I have the standard code. I didnt add nothing to that original universal Analytics code. 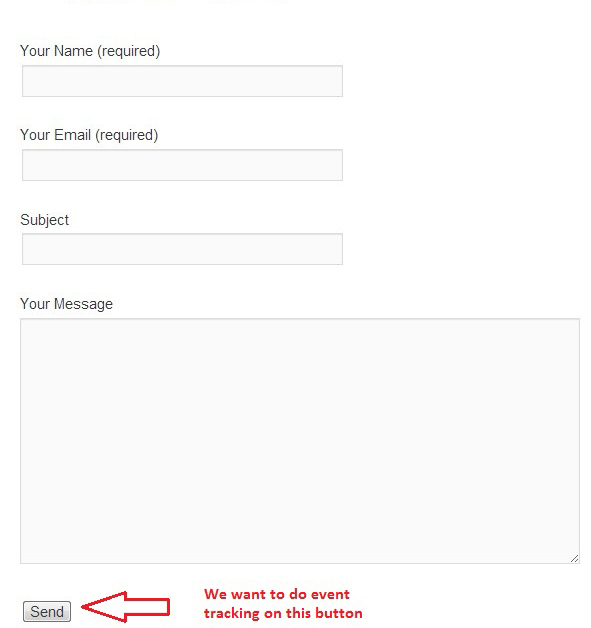 I have enable event tracking in that page and add a category name and an action. I also added the iphorm_submit to Element ID as instructed. Updated the page and then I did a test. I went to GA in events and nothing. Can you please let me know what am I doing wrong? Addictional information – I have set Element Classname as iphorm-submit-element is that correct? Hi, this one wasn’t answered, so I’m trying again – your plugin works like magic, but it does only for one element on the page. Is it possible to track some more? for example some basic stuff probably anyone will need to track is – a) how many people started to iteract with the form, like onfocus called from one of the input strings, and then how many actually hit submit button. Is it possible to have two (or more) elements tracked with events in GA? You bring up a good point and unfortunately my plugin handles one element for tracking per page because at the time I wrote it I was only seeking to provide a simple solution. To make the plugin handle more tracked elements will involve quite a lot of extra coding and time. I will put this on my TODO list but currently I have other more urgent tasks I need to take care of. Hi, I’d like to use your plugin, however, is it possible to track more than one event on a page/post and if so how do you do this? Many thanks. I would like to track event clicking on “Kuldes” button. Checking the code with firebug gives a similar result than yours, but it is not working. Categories and actions are set in google analytics. Can you tell me, what should I do? Have you double checked that you have set up your goals/events correctly in your analytics account? love the plugin, I have some custom themes that are building out their own headers. Is there an include I can put in the template to force the check for content experiments so it includes your code? Thanks. The best way would be to use a hook from your theme which pertains to the header. All well coded themes should have a hook which gets fired when the header is displayed. Can’t understand something… if I want to check 2 pages, one with green header and one with blue header, how to create the variation page? If i will create page using WP CMS I will have my default header (green). You can achieve this by creating your own WP page template. Also there may be plugins out there which might do the job for you. I think there are “landing page” plugins you can use to achieve this too. Today I started experimenting with your plugin and the code doesn’t seem to be inserted. I wouldn’t know if this is because I run WP v3.5, as I didn’t have WP Content Experiments and Event Tracking while at v3.4. Amyway, I hope you can verify and test (possibly update). What exactly is not being inserted? The experiments code or the event tracking code? I have done tests with WP3.5 and I can confirm that all works fine as far as I can see. I installed your plugin, but can’t get it to work with my theme. I’m using the ‘Dealers’ plugin. In the default Twenty Eleven theme it works fine. Do you have any suggestions that can let it work? Thank you for your help. I discovered the conflict for the plugin to function properly in my theme is in the functions.php file. Do you have any suggestions? Is there perhaps a piece of code missing? Any help would be greatly appreciated. What type of error are you seeing?